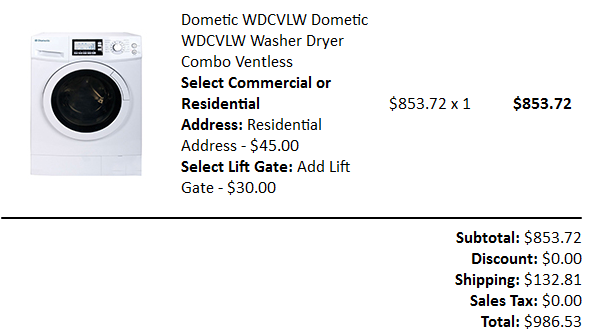 We asked the dealer, RV Station, to install the Whirlpool WFC7500VW washer and LDR3822PQ dryer. They told us it would fit and charged us a high, but stomachable, $1787 for the combo. The pair usually runs about $1350 online, plus maybe up to $100 in incidentals for the install, so the install was going to cost us roughly $337. That saves us time and saves me from having to cut a hole in the side of a brand new RV for a dryer vent, so we (perhaps stupidly) opted for it. This morning they came back saying that the pair would not fit and that they were going to substitute a Splendide WD2100XC for the same price. The problem for me is that the new unit’s MSRP is only $1349, and can be found for between $1000-$1200 online, and I even found one as low as $965.99+tax locally. Incidentals to install it are less because it isn’t stacking, so about $20. So they’re going to pocket at least $500 over the going price for the install, which should honestly take no more than a couple hours ($200) in shop labor. I contested this and asked that they throw in a Mor/Ryde or Rota-Flex pinbox to offset the difference, or charge a reasonable amount for the Splendide, but we haven’t been able to come to agreeable terms. Their current asking price is $1640 for the W/D, and another $604 ($100 more than the typical going rate) for the Mor/Ryde. I opted to request a refund for the $1787 and buy a Dometic WDCVLW from American RV Company, for $986.53 shipped to my door. It has pretty good reviews for a ventless unit, does not require cutting into the wall of the RV, and includes an install kit so there will be no incidentals to buy. I’ll pocket the rest of the refund and buy the Mor/Ryde if I decide I need it after testing out the Trailer Saver. Overall this experience has left me dissatisfied with the dealer, despite the good deal we got on the unit itself, because they have absurd margins on accessory equipment. I didn’t ask for a discount on the original W/D combo, but when they were not able to provide it as promised, I feel that they should have been willing to work with me to negotiate a reasonable price. I cannot recommend them because of this. After three business days (and six days, total) I had not heard anything about the W/D shipping. I called American RV Company this morning to find out that they could not fulfill the order, and wanted to upsell me $400 to another model that they could ship immediately. I requested a full refund and ordered a Midea MFL70-D1211S off Ebay, which is almost, if not, identical, for $679 shipped to my door. Also, after the ride home with the trailer last week, we have opted not to go with the Mor/Ryde. The Trailer Saver does great without it, and we can get to some pretty extreme angles without the slider being used!